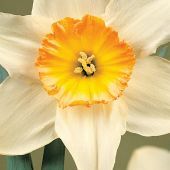 Daffodils (Narcissi) are one of the most abundant bulbous plants in gardens due to their Winter hardiness, the ease with which they naturalize, their many applications, variety of color and flower types and, in the case of large-flowered yellow daffodils, the promise that warm Spring air isn't far behind. 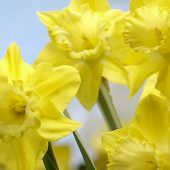 Daffodils are also an important cut flower and increasingly more popular as potted plants. 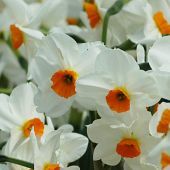 Several varieties are also quite sweetly scented and practically all daffodils can easily tolerate temperatures of 14F / -10C (with Tazetta types and some of the smaller species being the only exceptions). 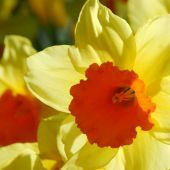 Daffodils actually behave as perennial plants, which makes them indispensable in borders, especially those with perennials chosen for their Summer color. 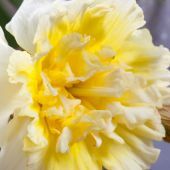 In that case, daffodils debut ahead of the perennials which will eventually emerge to cover the withering foliage of the daffodils. 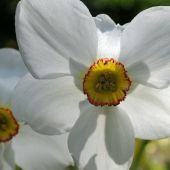 Their shade tolerance makes them useful for planting under shrubs and trees, and their bright yellow and white colors contrast nicely amidst somber-looking evergreen shrubs, conifers and groundcovers. 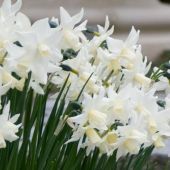 You can plant them in the lawn as well, as long as you wait six weeks after flowering to allow the foliage to wither (rejuvinating the bulbs for next years flowers) before mowing. Of course you can also mow in between or around the plants during those six weeks. 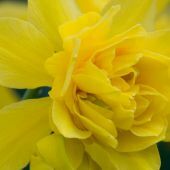 PLANTING IN POTS AND CONTAINERS: Your container should be at least 12" (30 cm) deep (to allow for proper planting depth and safeguard their development) and have sufficient drainage holes in the bottom (or near the bottom on the sides). Add clay granules or pot shards in the bottom to improve drainage then add ordinary potting soil mixed with 1/3 sharp sand or light garden soil. 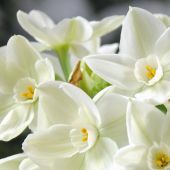 Fill the container up to about 6'' (15 cm) below the rim, arrange the bulbs so that they almost touch each other (for massive color effect), press the bulbs carefully into the soil (pointed ends up) and add soil up to 1/2" (1 cm) below the rim. 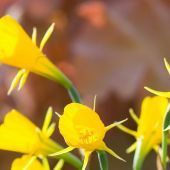 Don't forget to add water during dry spells when temperatures are above freezing. 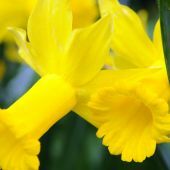 You can plant Winter pansies, forget-me-nots or ornamental cabbage on top of the daffodils to keep the containers more attractive for a longer time. 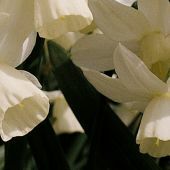 (When the frost has killed off those plants or as the daffodils start to emerge, trim those over-plantings back, do not pull them out as this could damage the bulbs). 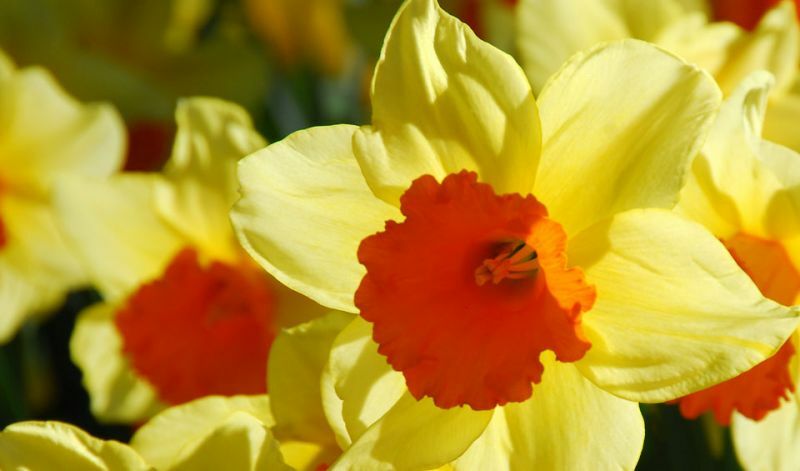 Daffodils can suffer damage from extremely low temperatures when the cold penetrates the containers from all sides. So if you expect a really hard freeze find a temporary site where the frost will not set in. You can also wrap containers in plastic bubble-wrap if they are too big to move or if you do not have a frost-free space. Cover the soil in any case with straw, reeds or leaves. 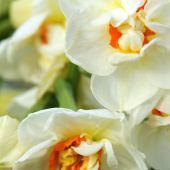 Of course you can also add some tulips or hyacinths instead of filling the container totally with daffodils alone: this will extend the flowering time by quite a bit as well you will have more choices of color combinations to choose from.